WSJT-X implements communication protocols or "modes" called FT8, JT4, JT9, JT65, QRA64, ISCAT, MSK144, and WSPR, as well as one called Echo for detecting and measuring your own radio signals reflected from the Moon. These modes were all designed for making reliable, confirmed QSOs under extreme weak-signal conditions. JT4, JT9, JT65, and QRA64 use nearly identical message structure and source encoding (the efficient compression of standard messages used for minimal QSOs). They use timed 60-second T/R sequences synchronized with UTC. JT65 and QRA64 were designed for EME ("moonbounce") on the VHF/UHF bands; JT65 has also proved popular and effective for worldwide QRP communication at HF. JT9 is optimized for the LF, MF, and HF bands. It is about 2 dB more sensitive than JT65 while using less than 10% of the bandwidth. With either JT9 or JT65, world-wide QSOs are possible with power levels of a few watts and compromise antennas. JT4 and QRA64 are optimized for EME on the VHF and higher bands, and especially the microwave bands from 2.3 to 24 GHz. FT8 is operationally similar but uses T/R cycles only 15 s long. MSK144 is designed for Meteor Scatter on the VHF bands. These modes offer enhanced message formats with support for nonstandard callsigns and some popular contests. As described more fully on its own page, WSPR mode implements a protocol designed for probing potential propagation paths with low-power transmissions. 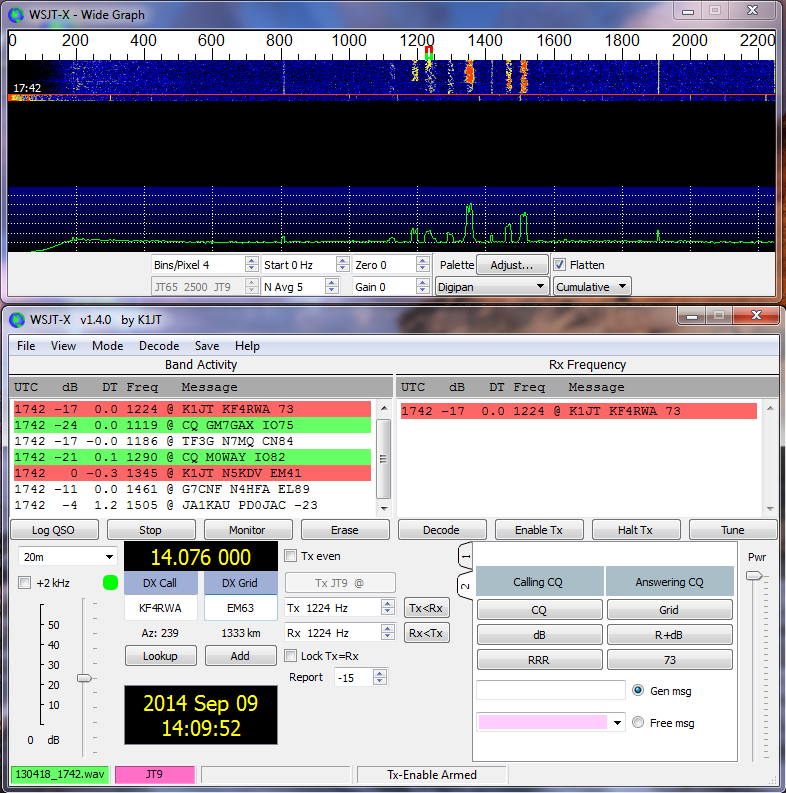 WSPR is now fully implemented within WSJT-X, including programmable "band-hopping". Upgrading from WSJT-X v2.0.0 will be seamless. There is no need to uninstall or move any files. Documentation: The WSJT-X 2.0 User Guide is available online. This document should always be your first source for help. Use your browser's search facility to find a keyword or topic. If you plan to use FT8 DXpedition Mode, be sure to read the FT8 DXpedition Mode User Guide. 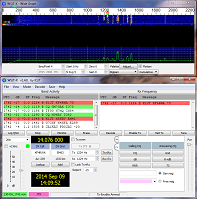 You must use WSJT-X 2.0 (or later). Versions of WSJT-X labeled with a "-rcx" suffix, for example WSJT-X v2.1.0-rc1, are Release Candidates sometimes offered temporarily for beta testing purposes. You should upgrade to the GA release when it becomes available. The -rc# program versions are not suitable for long-term general use. No release candidate is currently active, so none should presently be used on the air. Version 2.0.1: wsjtx-2.0.1-win32.exe. (runs on Vista, Win 7, Win 8, and Win 10, both 32- and 64-bit versions). Note: these packages are unlikely to install properly on Linux distributions with required dependencies at lower versions than those on the named distributions. In such cases building from source is the correct way to install WSJT-X 2.0. Installation instructions for version 2.0.1 can be found here in the User Guide. Build and installation instructions are in the INSTALL file inside the tarball.